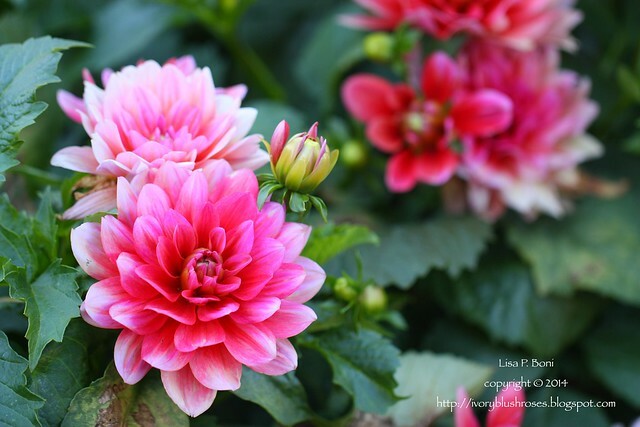 I've never grown dahlias before, but when we were hunting for flowers to fill the beds for Jessie's wedding, these beauties caught my eye and I had to give them a try. With hindsight, I realize I probably should have staked them. 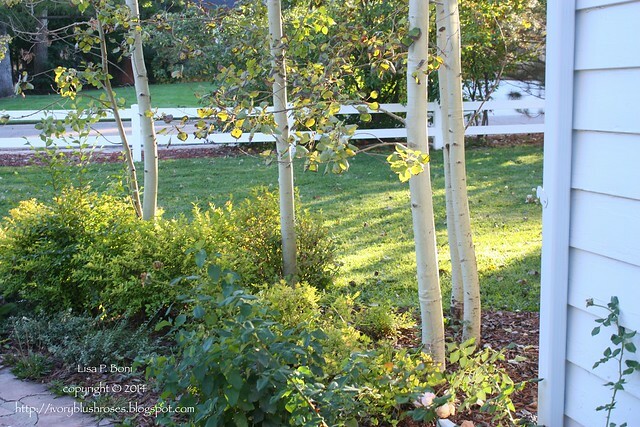 They have grown into a huge mound of lush leaves and spectacular blooms with stalks creeping across the ground! It certainly hasn't had a negative impact on the amount of blooms it produces! 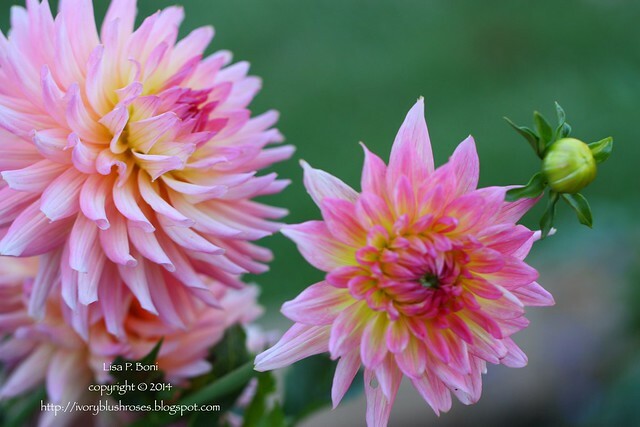 This dahlia stands taller on it's own and while it doesn't have quite as many blossoms as the other plant, it still is amazingly beautiful with flowers that seem to get larger and larger as they open more fully. The front walk has been sadly neglected this year, with most of the focus on other parts of the yard for the wedding. 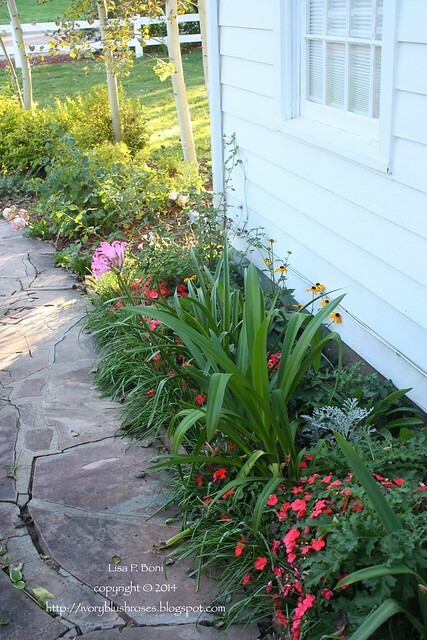 But we did add a flat of coral colored impatiens and tucked in a few more perennials here and there. It's an overgrown mess with grape hyacinth leaves, thistles (a never ending battle to get rid of), and the strapping leaves of various late blooming lilies. There are also some volunteer Rudbeckia blooming along the foundation. When the lilies are all done blooming, I need to move them back in the bed a little bit as when blooming, the blossoms lean over the walkway and get knocked about. 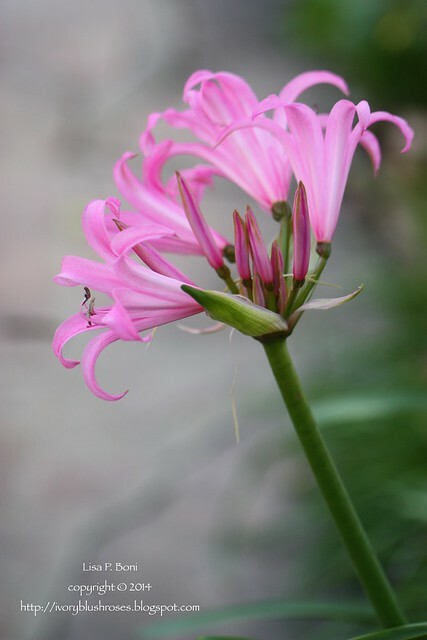 I just love the surprise of these bright pink Nerine Lilies. All summer, there is just a fountain of large leaves and then now, at the end of the growing season, stalks of beautiful pink lilies come forth! 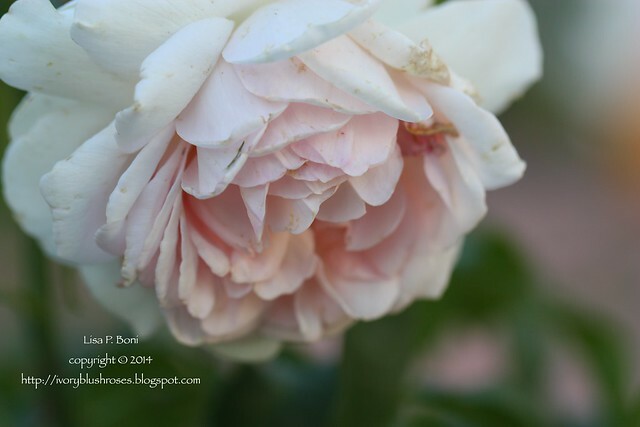 The rose blossoms are taking on an aged appearance, which is beautiful in it's own right. I never thought I'd ever say that an orange rose would be one of my favorites, but this "Lady of Shallot" rose by David Austin has surely become a favorite. Even in it's first season in my garden, it has bloomed repeated all summer long! 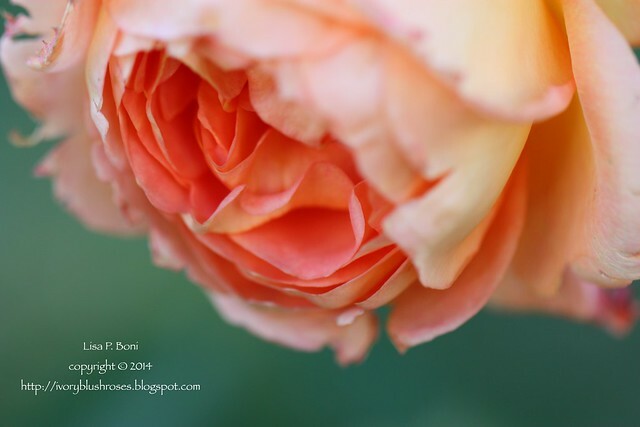 Next year I hope to add another orange rose, "Crown Princess Margareta" or maybe "Lady Emma Hamilton" - both in luscious orangey yellow tones that I fell in love with when I went to the David Austin Roses garden in England. 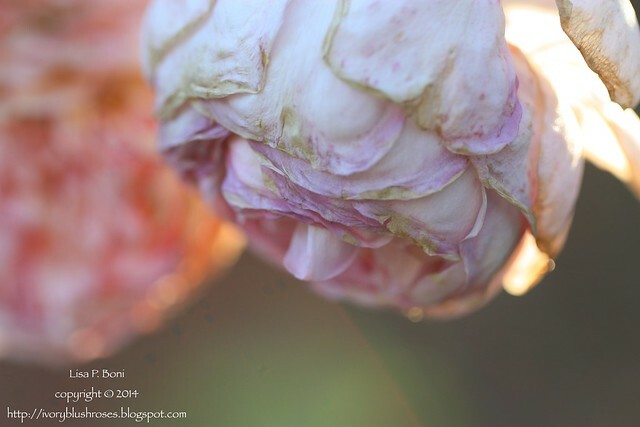 But it's the soft ivory blushed roses that remain my overwhelming favorites! I love the delicate shades, like the inside of shell. 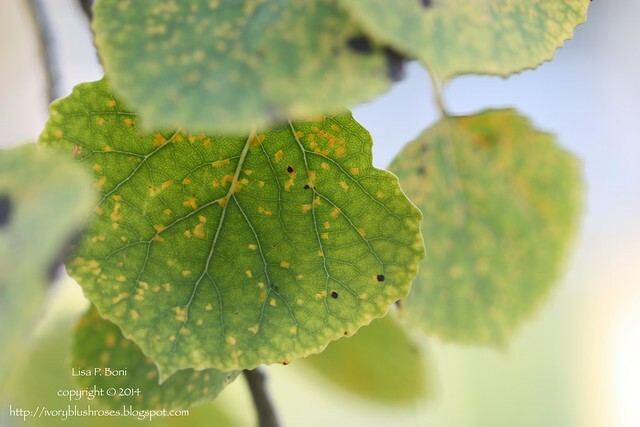 There are many aspen trees in my yard and they have been losing leaves quickly. It's a bit early, but while I was in Missouri for the CQI Retreat, we apparently had a light dusting of snow and that was enough to trigger the leaves to drop. Unlike in the mountains, they haven't turned brilliant golden, but rather a subtle mottling of color before the leaves turn brown and drop. They still catch the late day sun beautifully though. I like how the color change is almost pixelated. And on thinking about that, I wonder how I would have described it before the advent of computer screens! 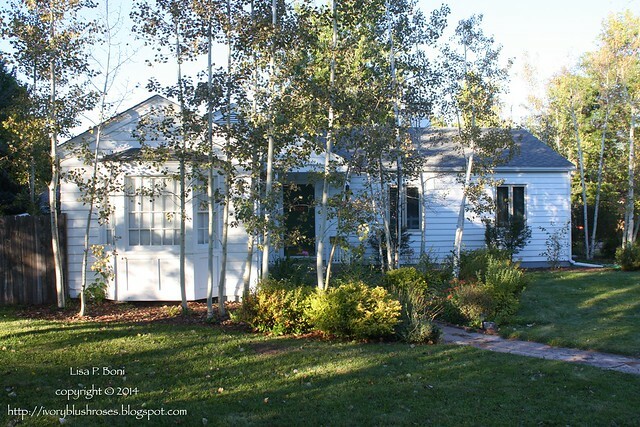 I'm still so happy with the lovely white color that I painted my little house! 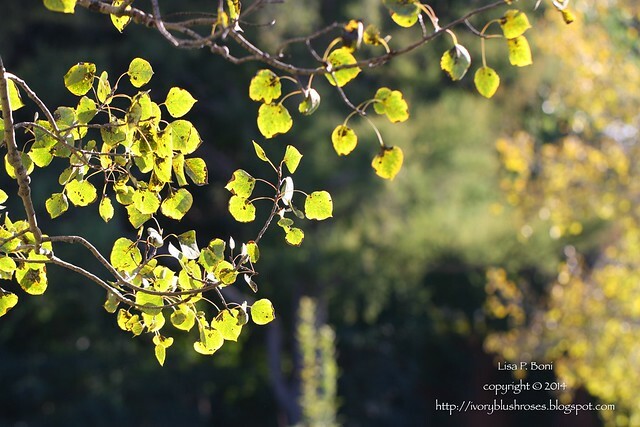 It looked gorgeous in the summer greens and still looks lovely as the colors fade into autumn hues! 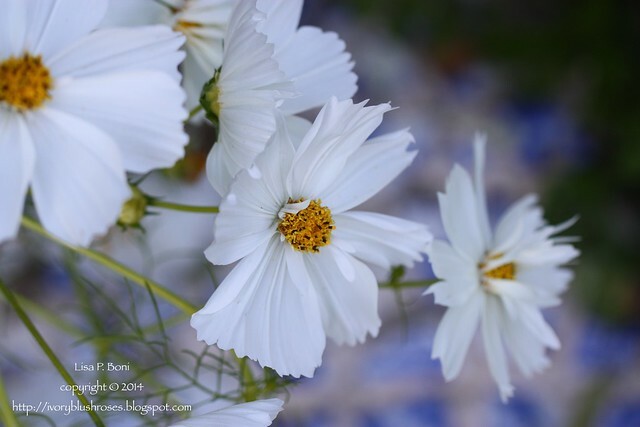 In the side garden, the cosmos are still blooming like crazy! Some are perfect wheels of eight petals and others have a frill added around the center! I planted a few yellow flowers to balance out all the white and pink. 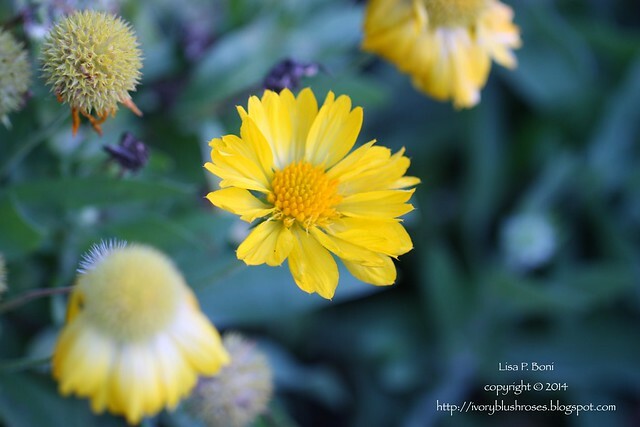 These blanket flowers are still going strong. 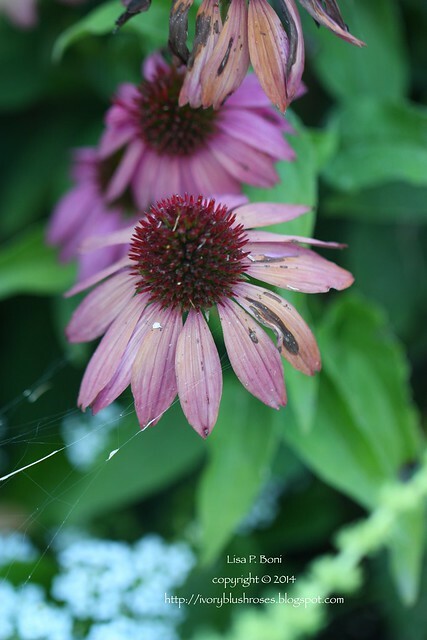 But the rosy tones of the echinacea are fading into that Victorian shade known as "Ashes of Roses". 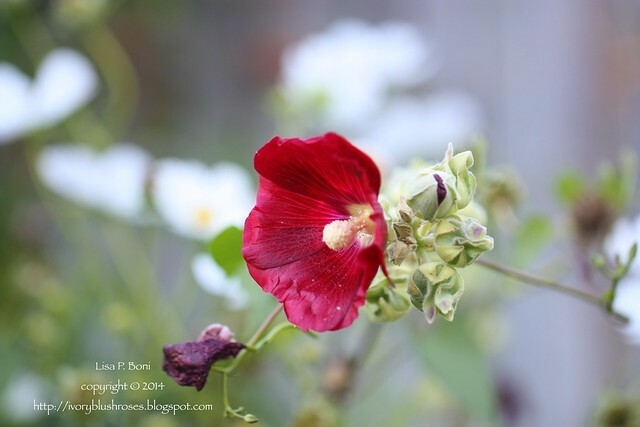 I do believe that this will be the last hollyhock blossom of the season. This plant was moved from behind the shed and though it struggled for a while, eventually it took hold and has bloomed faithfully all summer long! Even the petunias are still going strong and amazingly lush! I've never grown petunias en-masse before, and one of the pleasant surprises has been the lovely scent! 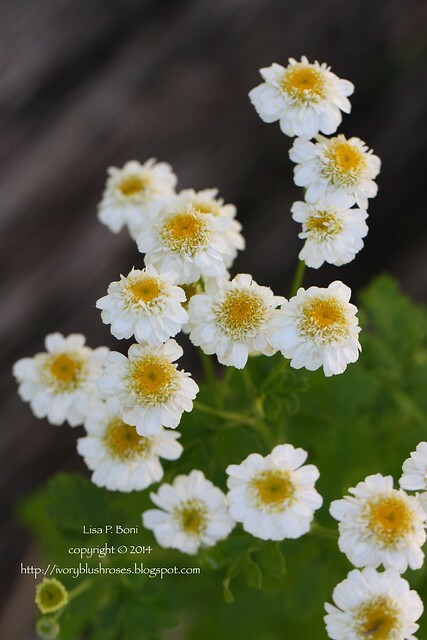 My Mother used to plant feverfew EVERYWHERE! My Dad used to pull it out every chance he got and it was often a bone of contention between them when it came to gardening. While I was in England, I fell in love with the robust varieties I saw there, but I wasn't able to find any seed for it and didn't think that customs would take kindly to me bring a potted plant through. So when my ex-husband offered me some feverfew from his garden, I accepted. He gave me three plants and all are doing well. Though I don't think I'll allow it to reseed quite as much as my mother did, I know I will enjoy having it to tuck into open corners! 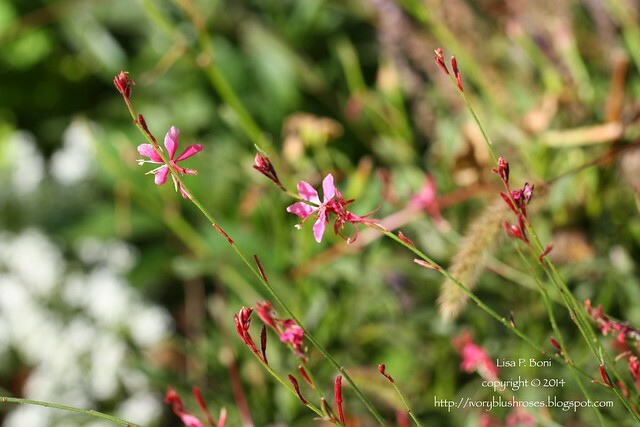 The Gaura, also known as "whirling butterflies" has bloomed delicately all summer long as well and only in the past few days has shown signs of slowing down. 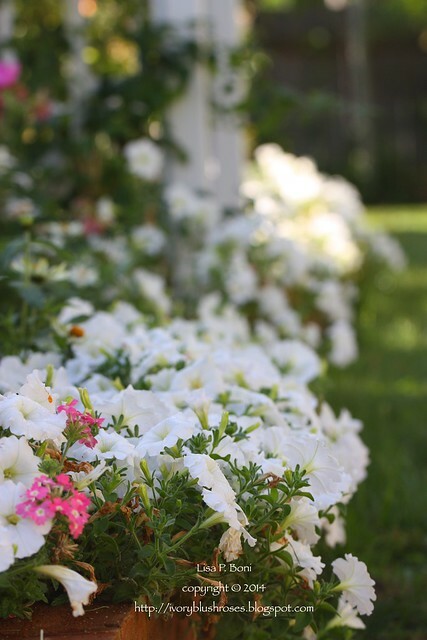 It's not a plant that you notice from afar, but when in the garden it adds a lovely delicate accent! The clematis only had a few blossoms on it - exactly what I expected for it's first season in the garden. 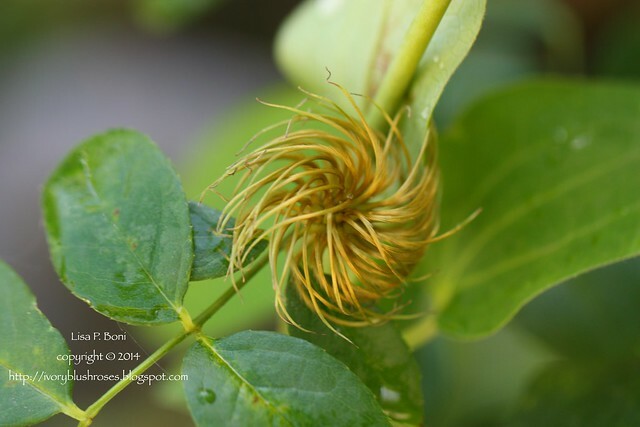 But those blooms left behind the lovely spiraling stars of seedpods. The pink rugosa rose has formed a number of large hips! Soon they will take on a reddish hue. 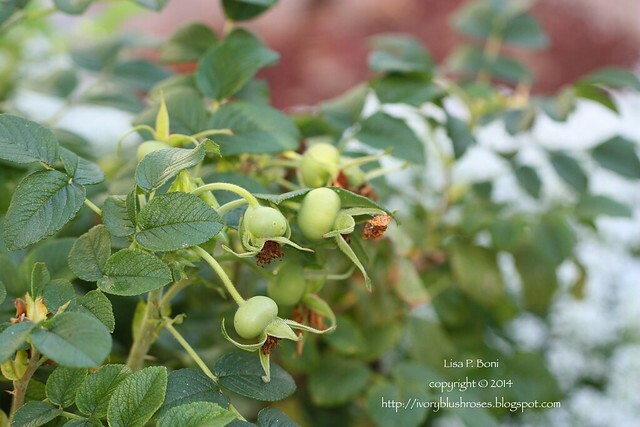 The hips are one of the reasons I planted this rose! 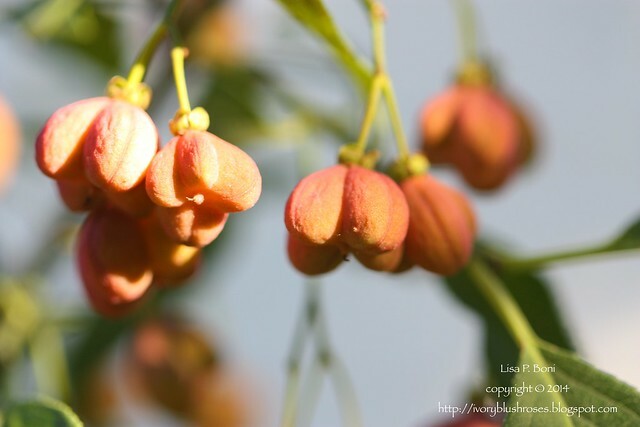 The Spindle Bush, also know as Bishop's Cap is loaded with orangey pods that will soon burst open revealing a hot pink seed inside! As the season changes, birds that I haven't seen all summer are starting to show up. 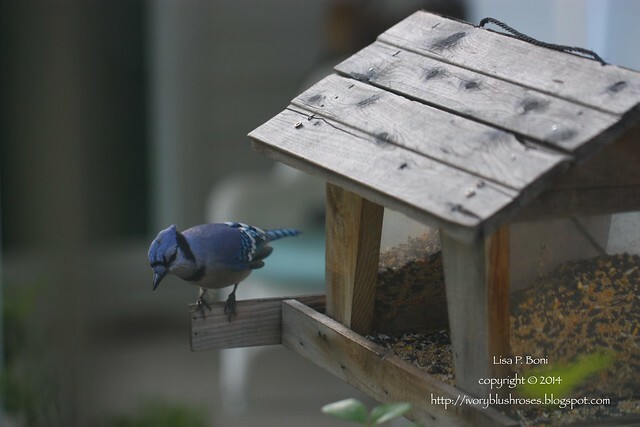 Among the first arrivals have been the Eastern Blue Jays and the Red Breasted Nuthatch! Time to stock up on birdseed! Thankfully, the Juncos haven't shown up yet, so winter is still a ways off! Wow, I just love all of your blooms at this time of year. You have a lovely, happy garden. 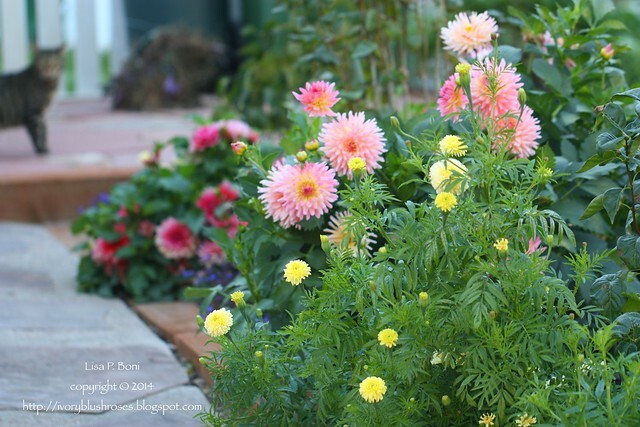 Such beautiful photos of your garden!